Our family fell in love with Duck Dynasty when it first aired, and we have continued to fall in love with each of the family members of the Robertson family. 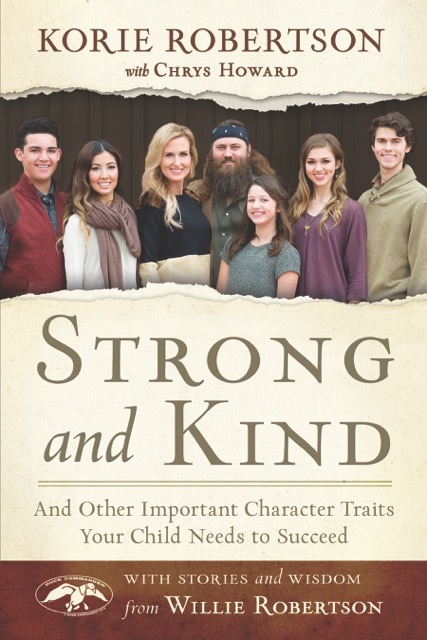 So we are truly honored to be able to tell our readers about Korie Robertson’s new book STRONG and KIND: And Other Important Character Traits Your Child Needs to Succeed. I have had my own battles with my two sons, and I feel empowered after reading Korie’s book that argues that developing good character in our children is one of the single most important things that we can do to help ensure they lead happy, healthy, adult lives. By making it possible to figure out what traits you want to see most in your children, Korie shares hands-on ways for nurturing those traits and strength of character. While I personally know the character traits and values that I want my boys to have and to uphold as they grow and become men – I honestly cannot remember a time when I actually sat down with them and discussed this with them. #MomFail on my part, right? I really – REALLY – enjoyed Korie sharing the tradition that her own father started (I’m all about starting traditions!) called the “Howard Family Legacy of Principles for Living.” It got me to thinking, What are the principles that I want to see my own children adhere to and remember? What values do I want them to take with them as they grow into becoming adult men? This list, throughout the years, provided a compass for Korie and her siblings whenever they forgot who they were, that little voice in the back of your head reminding you of the kind of person you wanted to be. Korie includes this list in the appendix of the book to help you start one for your own family. I absolutely love it – it’s pure genius! Korie explores key traits and what they truly look like in action, asks readers to select the two traits that they hope to see most in their children, and shares hands-on ways for nurturing strength of character. Written with her mother Chrys Howard and featuring stories and wisdom from husband Willie, STRONG and KIND cuts through the contemporary cacophony of parenting manuals to rediscover, unfold, and embrace the enduring wisdom that has guided the best parents for centuries. She is also an in-demand public speaker, Duck Commander® executive, entrepreneur and found of boutique Duck and Dressing, and philanthropist, who remains active with a variety of organizations that focus on children, adoption, and foster care. Korie lives with her family in West Monroe, Louisiana. I have listed several of the books that Korie has written for you below. I know after reading this one, I definitely want to read more of what Korie has written and I bet you will too! The Women of Duck Commander: Surprising Insights from the Women Behind the Beards about What Makes this Family Work, written with all of the Robertson wives. Our winner will receive a hardback copy of Strong and Kind from Korie, along with the EXCLUSIVE digital copy of Strong and Kind: My Family Legacy Workbook that accompanies the book! You won’t find this anywhere else! Hey Lovelies, I’m so excited to be on this parenting journey with you. It just might be the most challenging job we will ever have, but it’s by far the most rewarding. God gave those little munchkins to you—to teach, inspire, discipline, learn from, laugh with, cheer on, bandage up, dance with, and love without question or condition. I want you to know this: you are equipped for this task! Our world needs strong and kind kids and patient and loving kids; we need kids who are humble and joyful, honest and hardworking, loyal and compassionate.You get to decide what values you pass along to your children. Have fun! You’re going to be sooooo good at this! Remember that there are daily entries you can perform so be sure to come back each day to snag those! Good Luck to each of our readers!